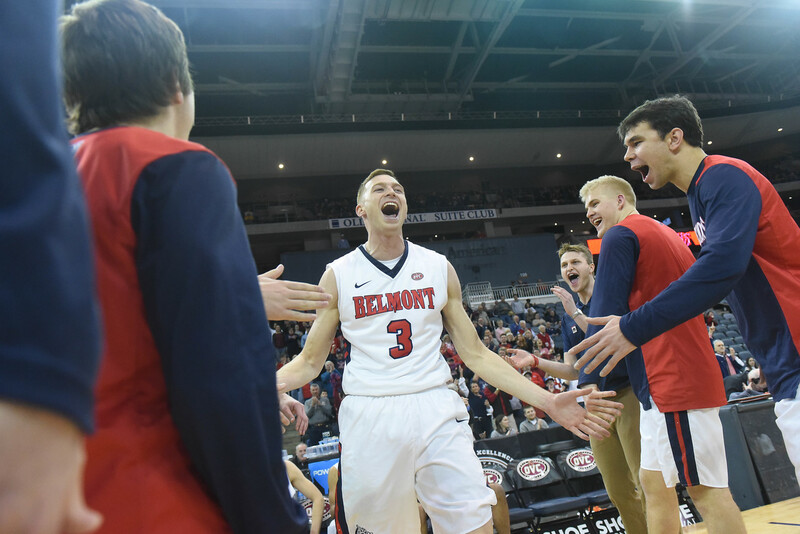 InsideHigherEd.com—an online trade publication for higher education—released today its own picks for the NCAA Men’s Basketball Tournament Bracket based solely on academic standards, and Nashville’s Belmont Bruins won the Championship trophy. On the road to the Championship, Belmont “defeated” some fellow academic powerhouses, including tomorrow night’s opponent Temple University, as well as Maryland, Yale and Baylor. In the Championship game on this bracket, the Bruins scored a win over Villanova to claim the Academic Championship. This marks the third time Belmont has claimed the InsideHigherEd Academic Bracket Championship, previously winning in 2013 and 2015. This season the Belmont men (26-5) secured their 10th conference regular season championship in 14 years. Last night the team learned on the CBS Selection Sunday live telecast that they had earned the first NCAA Tournament at-large bid in program history, and only the second in Ohio Valley Conference history. This will be Belmont’s eighth NCAA Tournament appearance, and the Bruins will face Temple University tomorrow in the First Four of the 2019 NCAA Men’s Basketball Championship. The Inside Higher Ed website annually completes an NCAA bracket based on each team’s academic performance, with teams in the bracket “competing” based on Academic Progress Rate (APR) scores, the N.C.A.A.’s multiyear measure of a team’s classroom performance. If teams tie on APR, Inside Higher Ed then moves to Graduation Success Rate, which measures the proportion of athletes on track to graduate within six years. Belmont’s men’s basketball currently boasts a perfect 1000-point APR as well as a 100 percent graduation success rate. Belmont has earned postseason invitations 13 of the last 14 years, including eight automatic berths to the NCAA Tournament. The Bruins rank top 25 nationally in 12 statistical categories, including first in assists per game and total assists, second in scoring offense and assist to turnover ratio, fifth in field goal percentage, and sixth in offensive efficiency and defensive rebounding. For more information on the Inside Higher Ed bracket, click here. Tip-off Tuesday for the Belmont Bruins versus the Temple Owls is set for 8:10 p.m. CT from University of Dayton Arena in Dayton, Ohio. The game will be broadcast on truTV, March Madness Live and Westwood One.